Un libro su Canterbury come non si era mai visto prima: You Are Here-The biography of a moment, un compendio della sua storia attraverso quattordici miliardi di anni, con il racconto accelerato di eventi da macroscopici a infinitesimali - dagli insondabili segreti del Big Bang ai dettagli apparentemente banali dell'ora di pranzo del 15 agosto 2014 - condensato in appena duecentocinquanta pagine. Che vi trovino degno posticino anche Wilde Flowers, Soft Machine, Caravan, gli accadimenti presso Wellington House o quelli al numero 5 di via Santa Radegonda lo si deve al fatto che l'autore è Matthew Watkins, fine matematico, divulgatore scientifico poco ortodosso, appassionato di musica e musicista egli stesso, sempre a caccia del genius loci nella sua area e altrove, che i più conoscono e apprezzano come titolare dei preziosi archivi Canterbury Soundwaves e Canterbury Sans Frontières. Il volume uscirà ufficialmente l'anno prossimo a febbraio per The Inamorata Press, ma lo si può ottenere già ora. An intriguing new "experimental-cosmic-local" history book about Canterbury (and more!) has appeared. You Are Here: The biography of a moment by the author and mathematician Matthew Watkins. The cover describes it as "an accelerating history of Canterbury from the Big Bang to noon August 15th 2014". The 1955-1967 and 1967-1976 sections go into quite a lot of detail about Daevid Allen, Robert Wyatt and his family, the Hopper family, the Daevid Allen Trio, the Wilde Flowers, Soft Machine and all that followed. And the earlier sections of the book provide some historical context for the emergence of the Scene. Where are you right now? Have you ever wondered just what it took to get you here? And what do we mean by 'here' and 'now', anyway? You Are Here: The biography of a moment is the visionary exploration of everything that led to one moment in one city in one part of the world. 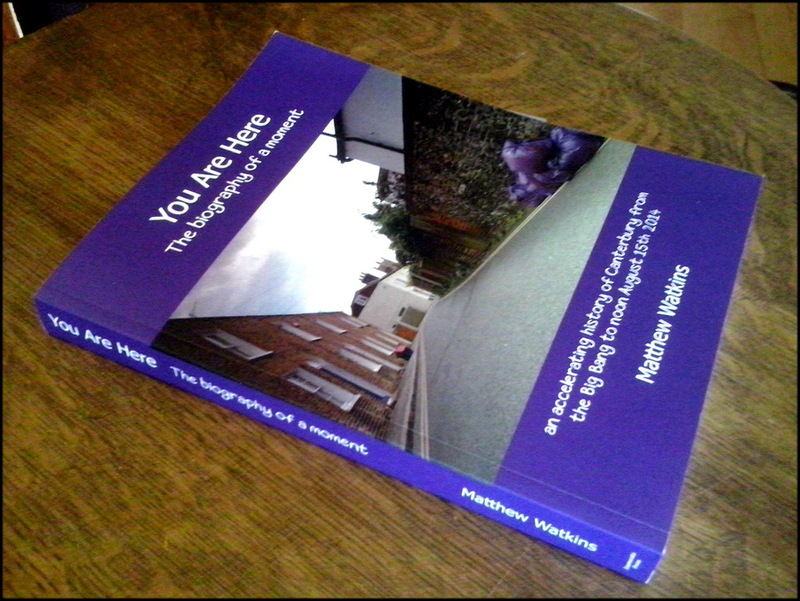 Part history, part cosmology, part psychogeography and part autobiography, You Are Here takes a radical perspective on the story of Canterbury, the Earth and the Universe, from the very, very large right down to the sub-microsecond instant. Drawing on mathematics and graphic novels, and full of illustrations, this is a cosmic and intimate trip through all scales of thought. You'll never think about the simple moment of being here in the same way again.